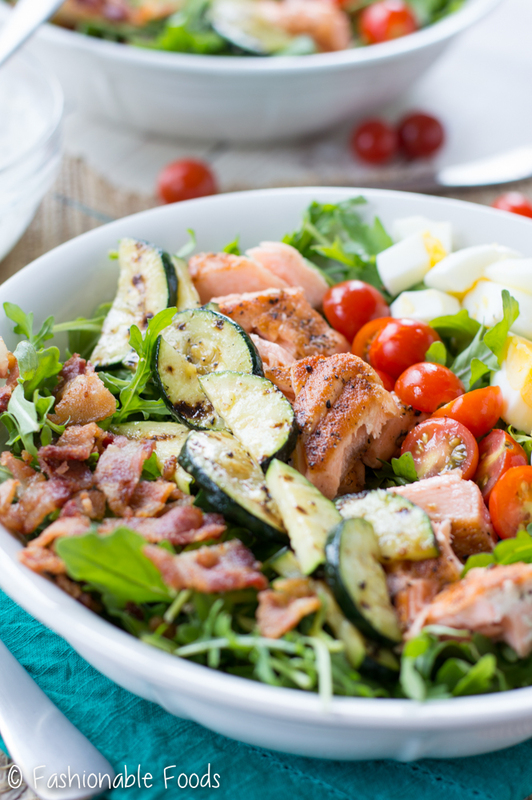 A tasty grilled salmon cobb salad that is full of grilled zucchini, bacon, tomatoes, eggs, and arugula for a spicy bite. Top it off with an easy ranch dressing for the perfect summer meal! Happy, happy Thursday! Is it just me, or is this week dragging on? I am so happy that we are so close to the weekend! Speaking of the weekend, do you guys have any fun plans? My plans include working in the garden and heading to the greenhouse to pick up some fall vegetable plants! Although I’m not ready to admit that fall is right around the corner, I am pretty excited to get the fall garden set up. In the meantime it’s all about grilling anything and everything, eating tons of tomatoes, and of course my bff the zucchini. ? Today’s recipe is one of my absolute favorite salads. 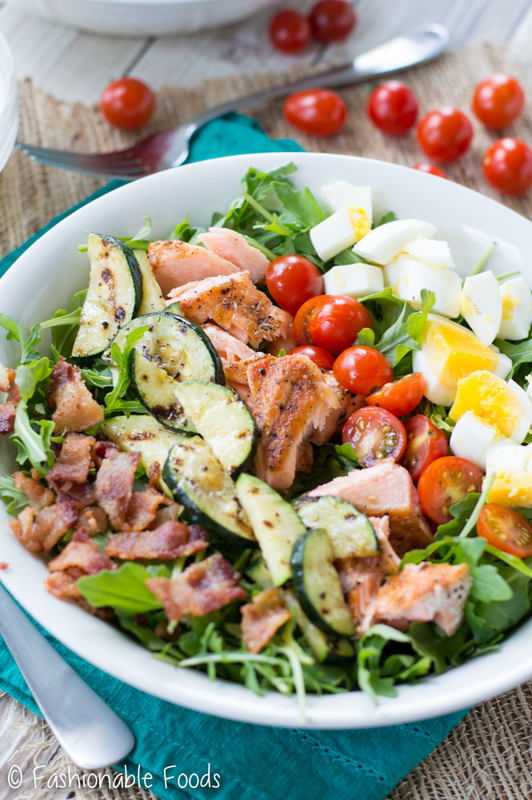 I LOVE a good cobb salad, so I decided to put a healthy spin on it. 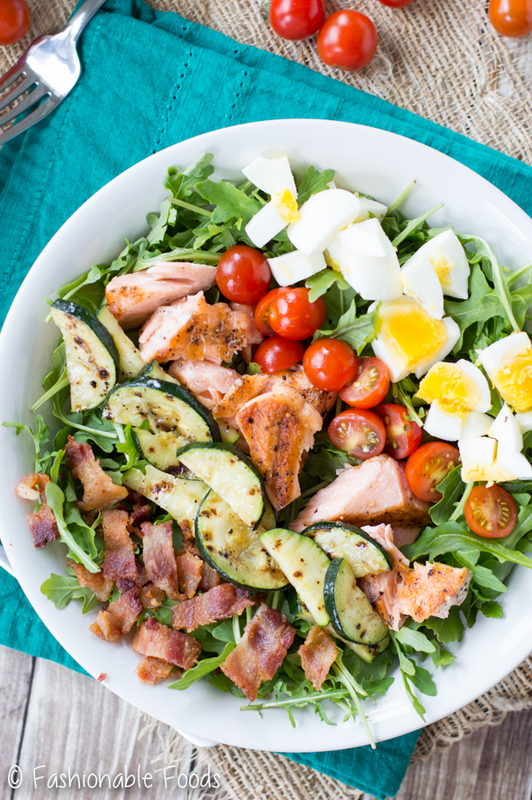 Not only is this the perfect summer salad, but it’s Paleo and Whole30 compliant! 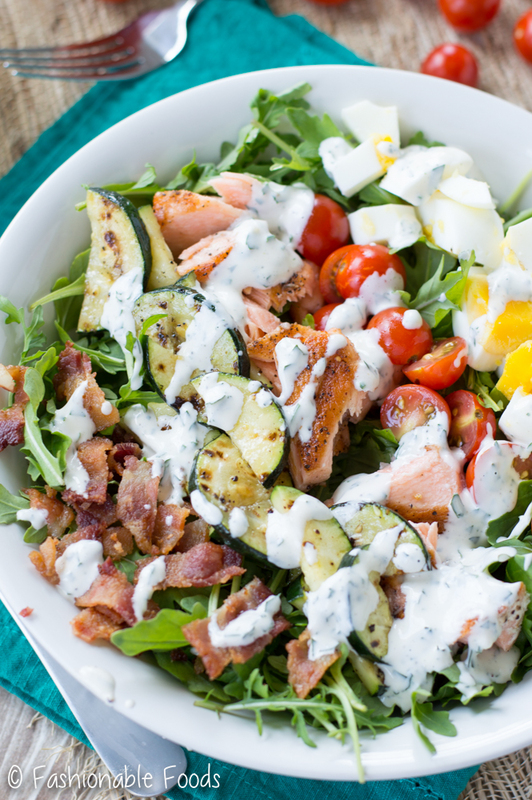 Now, this is definitely not your traditional cobb salad. 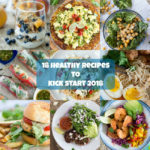 I use arugula instead of a crunchy lettuce, there’s no cheese, salmon instead of chicken, and no avocado. I went with grilled zucchini over the avocado because, well, you know me and zucchini. I’m mildly obsessed with arugula and if I’m being completely honest, not a big fan of iceberg or romaine lettuce. Arugula just has so much more flavor than iceberg or romaine! However, if you’re a fan of crunchy lettuces by all means use your favorite. You can really use whatever your favorite dressing is. I think a simple vinaigrette would be perfect. I was in the mood for ranch, though, so I went ahead and make a Whole30 compliant version. It’s SUPER easy. Get yourself some paleo mayo (I make this one), garlic, vinegar, and a few herbs. Whisk it together and that’s it! 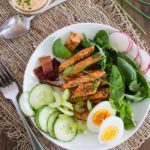 This grilled salmon cobb salad is the type of salad that I crave and actually get excited about eating. Nothing boring about it! 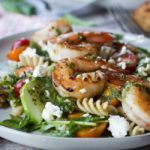 Do yourself a favor and savor the last weeks of summer by making this salad! It’s the perfect lunch or light dinner when you don’t want to heat up the kitchen! Have a fantastic weekend! ? Preheat the grill (or a grill pan) and drizzle the salmon filet and zucchini rounds with the olive oil and season with salt and pepper. Cook the zucchini until grill marks appear and then flip and repeat on the other side. This should only take a few minutes. Grill the salmon for about 5-7 per side or until opaque throughout and it flakes easily with a fork. 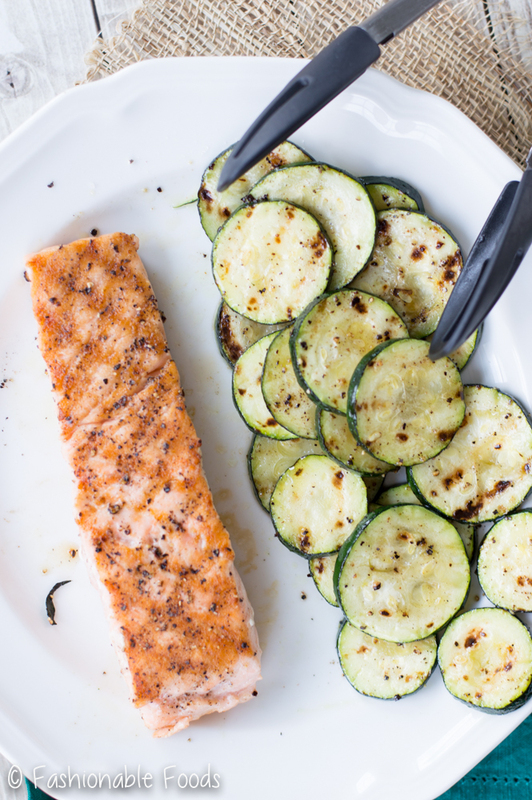 Once the salmon is done, flake it into bite-sized pieces and set it aside along with the zucchini to cool slightly while you prepare the rest of the salad. 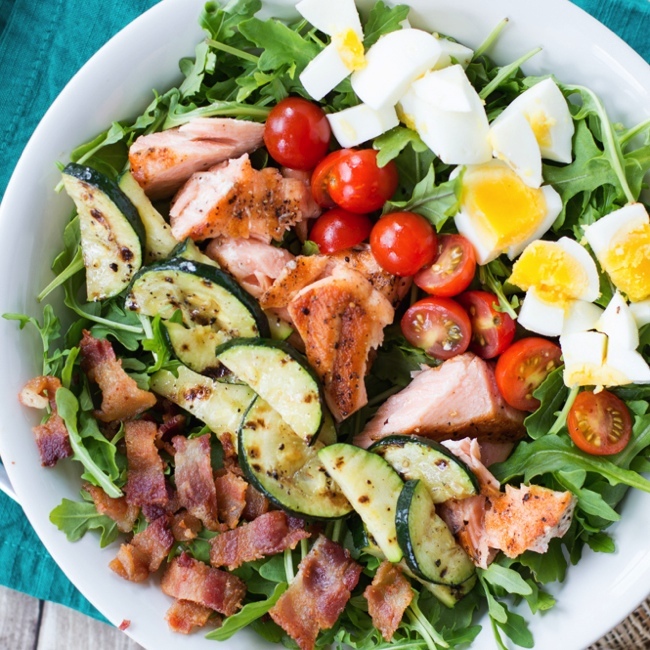 Divide the arugula equally among two bowls and then top with bacon, eggs, tomatoes, zucchini, and salmon. To make the dressing whisk together the mayo, vinegar, garlic, parsley, and chives in a small bowl. Serve the salad drizzled with the dressing and enjoy! This looks awesome. 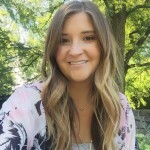 Are you doing Whole 30? Also, where do you get your salmon? I have an issue finding non-farm raised salmon. Thanks! I’m not doing a Whole30, just trying to eat a few Whole30 recipes per week. Costco has a decent wild salmon.. I kind of alternate between the farm raised and wild because I don’t love the taste of the wild even though it’s better for you :/There’s a fish place down here we got clams at last week that has wild so I’m going to try that next. I am with you on the week dragging thing. Yay, the weekend is almost here! 🙂 This mouthwatering salad bowl looks so pretty and summery. Grilled salmon + grilled zucchini + arugula = awesomeness. And that ranch dressing sounds wonderful. OMG, this weekend IS seriously dragging on!! I feel like it should at least be Friday today. At least the weekend is in sight though! Sounds like you guys have a productive, but relaxing weekend planned! I don’t know what we are going to do, but it always includes grilling, and I am totally thinking THIS delicious salad NEEDS to happen! 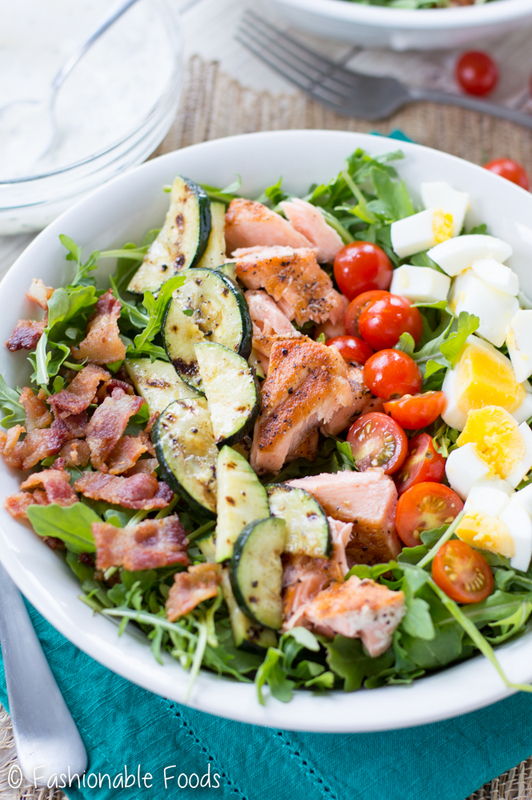 I’m a huge salmon lover, and while I love a traditional cobb, this is so much better!! All your substitutions and tweaks are just perfect, Keri!! Can’t wait to try this!! Pinned! Cheers! Grilling is the perfect weekend activity! Thanks for the kind words Cheyanne and enjoy your weekend! I hope that you are having a great weekend. I’m studying for two final exams at the moment (well, at the moment I am procrastinating by catching up on blogs), but it means that the days seems to alternate between dragging on and going too fast that I don’t get enough done. A vicious cycle that. What a gorgeous salad, Keri! 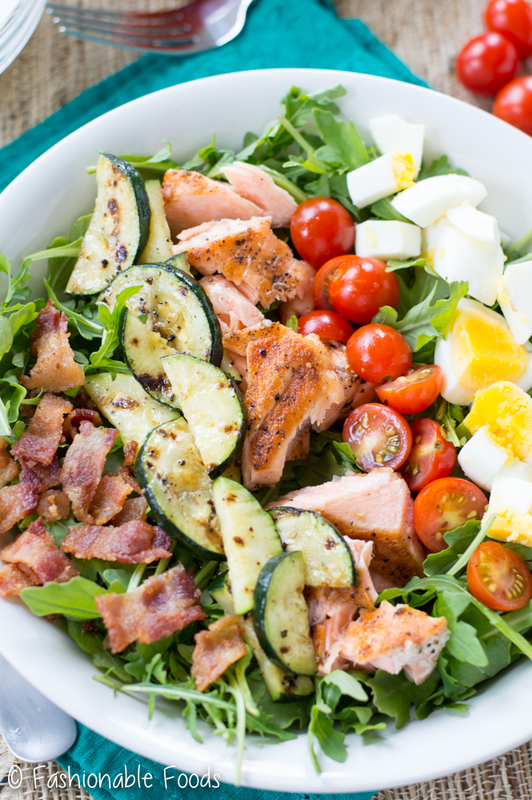 Cobb salads are my favorite, but you totally made it even better with salmon and the zucchini in here. Sounds perfect for lunch or dinner! Hi! Do you think this can this be prepped ahead of time and can leftovers be enough kept in the fridge? Hi Mina! Yes, that will work perfectly!